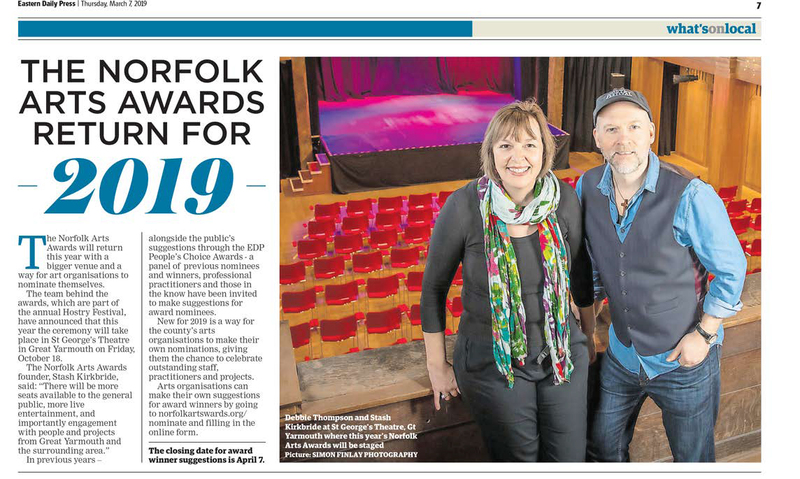 Welcome to the Norfolk Arts Awards 2019, in association with the Eastern Daily Press. The Arts Awards is the Hostry Festival’s annual gala event, celebrating the rich and diverse world of arts and culture in Norfolk. Each year new professional people join the Arts Awards Panel, all of whom nominate individuals and projects from all across the county. In order to make sure the project offers the public the chance to have their say too, we work in association with the EDP each year, where you can have your chance to nominate your favourite artist/project/venue in the EDP People’s Choice Awards. New for 2019, we have opened up the nomination process to arts organisations across the county. The full list of who’s been nominated for 2019 will be revealed in the Hostry Festival brochure and in the EDP in early July. Be sure to join in though our social media, on facebook & Twitter. The Arts Awards has been running since 2012 and has grown each year in its standing in the community, with new partnerships and supporters arriving all the time. On behalf of myself and Peter Barrow, the Arts Awards Executive Producer, we thank you for your interest in the Norfolk Arts Awards 2019. Co-founder of the Norfolk Arts Awards and the Hostry Festival at Norwich Cathedral. Listen to the Hostry, Ar tistic Director Stash Kirkbride on BBC Radio Norfolk discussing the 2018 festival line up. The Norfolk Arts Awards © was founded by Stash Kirkbride and Peter Beck in 2012, and is a Hostry Festival project.